Team Umbra had existed as a whisper on the lips of criminals around Kasei until the group's formal creation sometime shortly after the joint Underground/Team Stellar attack on Port Nuovo during Typhoon Carracosta. Frustrated with the groups' mismanagement of power in the underworld during the following months, members sought to bring the various crime groups to heel by offering a more organized, central hierarchy to crime and the ideal conditions to continue their nefarious deeds. Following a brazen attack on the Kasei Poison Control Center, based in Bayou Bay, Team Umbra managed to secure a highly-altered version of Amoongus's Rage Powder, and used it in conjunction with a concentrated, liquefied version of the Null Shade that was then introduced to test subjects. The subjects exhibited rage, a complete suppression of free-thought, and most noticeably, a purple, mist-like aura. Umbra Commander Ansel identified the pokemon as the same as those seen in the Orre Region and thus referred to them accordingly; "Shadow Pokemon." Unable to level up or evolve, these pokemon had the interesting side-effect of a complete lack of type weakness or resistance. Their attacks, shadow versions of regular moves, had the same neutral-typing effect. Many members of the team have since incorporated Shadow Pokemon in their schemes to their advantage. Team Umbra has been developing Shadow Pokemon in 3 phases of increasing potency known as Primary Wave, Secondary Wave, and Tertiary Wave. Ansel has refined the shadowing process a bit more with each subsequent production wave, using higher evolutionary levels with each wave due to their increased endurance. As of late, rumor has circulated about Ansel perfecting the shadowfication process, creating a group of Perfect Shadows known as the "Trinity." After a considerable amount of anticipation and planning, Team Umbra finally unveiled their largest plan to date: The capture of Kasei's captial, Ensou City. In a brazen shock and awe offensive, the group stormed the city set their perceived endgame into motion. At the climax of action, the organization's leader, the elusive Shadow Man appeared, and revealed himself to be none other than [[ Jet]] , the Darkrai-fusion responsible for Typhoon Carracosta almost exactly 2 years before. He went about reactivating the Tempest, a weather control device that was stolen from Team Lunar, and plunged Kasei into a seemingly endless night that saw Kasei enveloped in a region-wise storm of darkness using the harvested negative emotional energy collected by the Shadow Pokemon the organization released throughout the region. It was during this confrontation that Commander Scylla decided that she had had enough enough of Umbra's madness, and fled the organization. To make matters worse, Jet also awakened the Trinity, which was revealed to be shadowed versions of Unova's Tao Trio: Reshiram, Kyurem, and Zekrom. On top of that, rumor of something called the "Swarm" has be heard, passing the lips of certain high-level Umbra admins. Following the release of numerous Shadow Pokemon into Kasei, Team Umbra fell eerily quiet, and a state of uneasy calm fell over the region. However, in recent days, large numbers of registered gym trainers have been mysteriously vanishing without a trace, leaving authorities to believe that the organization may be behind these abductions in preparation for an operation in the capital of Ensou City. The endless night that was Team Umbra's storm blanketed Kasei for almost a month, pouring a seemingly ceaseless deluge of dark rain across the region that slowly sapped the strength of people and pokemon unfortunate to be caught out in it without adequate protection. The combined efforts of [[Team Terra]] and [[Team Lunar]] were instrumental in the sheltering of citizens and pokemon from the rain's onslaught as well as developing a means to combat the dispel the weather anomaly outright, with many attempting to get above the clouds to no avail. Following weeks of nonstop construction, Team Lunar completed the massive airship, aptly named Cloudpiercer. And after a joint briefing with members of all the League's teams, a select group was prepped ready to board the Cloudpiercer with the improved and repurposed Tempest in tow. rob them of them of their food supply. To make matters worse, Jet himself returned, bringing with him both Shadow Zekrom and Reshiram as well as two of his top lieutenants. After a grueling and distressing battle, the Tempest was finally charged with water and moonlight and fired. The resultant reaction quickly dispelled the storm, sending the remaining Swarm to flee in defeat. This night served a one of Team Umbra's most crippling defeats, and sent the group back into the shadows for the time being. '''The Shadow Man'''- Umbra Leader - Identity currently unknown. Actual existence is a topic of debate. Has only been mentioned in passing as well as in a brief speech shown on KNN News. Team Umbra remained eerily dormant for months following its rout at the hands of Team Pulsar in the skies above Kasei. However, shortly after the New Year, in a chilling address to the region, Jet announced Umbra's resurgence as well as his final vision for the world. He revealed that nearly the entire defeated Darkrai "Swarm" had been 'collected' by Team Umbra, and taken to the organization's key lair,[[ Darkmoon Island ]], off the coast west of Bayou Bay. The Darkrai's energy was to be used to power Umbra's 'magnum opus,' The Deimos Trigger, a weapon capable of tearing open the 'Dreamscar' between the real world and the Dreamworld and corrupting reality itself. '''Cia''' - Krookodile-fusion Chief Admin NPC: Essentially in charge of Team Umbra in most cases. Cold and calculating. Very goal-oriented and easily annoyed by distraction and failure in her subordinates. '''Ansel''' - Sableye-fusion Admin NPC: Runs Team Umbra's Shade Laboratory. Develops most of the technology the group employs in its schemes. Thought to be the most brilliant mind in the organization while also the most eccentric. Undeterred, the Umbra leader siphoned the Trigger's remaining energy into himself to assume a 'Final Form' which he used to launch one more personal assault against the League. After failing to thwart Kasei's heroes by pitting them against shadowy versions of themselves, Jet retreated into the Dreamscar to regroup for a final confrontation in the Dreamworld unaware that a trap laid waiting for him. Upon his arrival, he was immediately beset upon by the pursuing League members and forcibly split from the host he was controlling. Cornered and disoriented from unfusing, Jet was summarily defeated, and his essence began to be pulled into a capture crystal that had been prepared prior to the battle. Jet fought hard against the pull of his prison, however he eventually lost out, but not before delivering a parting shot, stating that "Heroes always get remembered, but you know legends never die." With that chilling and cryptic statement, the leader of Team Umbra was sealed away in his crystalline confines to slumber until someone is brazened enough to set him loose on the world again. '''Scylla''' - Houndoom-fusion Admin NPC: Playful, teasing, a bit absent-minded and equally short-tempered. A VERY sore loser. Team Umbra is comprised of a large number of sleeper cells that are activated for various reasons, and take orders from one of the 3 regional section centers. Each center is lead by one of the Admins, and serves as a base for Umbra's influence of power over its specific geographic region. Each center coordinates with each other to further the organization's goals, but each one is fully capable managing the entire organization should one or the other two another become inoperable. The exact location of each center is unknown to most, but it is speculated that each is located underground. '''The Combine''' - Controlling Admin: Scylla. Maintains Umbra's influence in Western Kasei. The Combine is the entry point for all grunt-level members following recruitment. Additionally, it houses the bulk of Team Umbra's actual force, so to speak. '''The Combine''' - Maintains Umbra's influence in Western Kasei. The Combine is the entry point for all grunt-level members following recruitment. Additionally, it houses the bulk of Team Umbra's actual force, so to speak. '''The Sandbox''' - Controlling Admin: Ansel. Maintains Umbra's influence in Eastern Kasei. The Sandbox is responsible for all of Team Umbra's technological advances. The Null Shade as well as Shadow Pokemon are developed here, and promptly transported to the Combine for distribution to the various cells about Kasei. '''The Sandbox''' - Maintains Umbra's influence in Eastern Kasei. The Sandbox is responsible for all of Team Umbra's technological advances. The Null Shade as well as Shadow Pokemon are developed here, and promptly transported to the Combine for distribution to the various cells about Kasei. '''The Core''' - Controlling Admin: Cia. Maintains Umbra's influence in Central Kasei. The Core is the de facto headquarters for Team Umbra. The Core coordinates all of the organization's plans, and has oversight over the other two centers. It is easily the most heavily-defended of the 3 centers; the best of the Team Umbra's operatives are stationed here. '''The Core''' - Maintains Umbra's influence in Central Kasei. The Core is the de facto headquarters for Team Umbra. The Core coordinates all of the organization's plans, and has oversight over the other two centers. It is easily the most heavily-defended of the 3 centers; the best of the Team Umbra's operatives are stationed here. '''[[ Darkmoon Island ]]''' - The key lair for Team Umbra. A previously hidden installation off the northwestern coast of Kasei where the organization launched its more final, most dangerous weapon, The Deimos Trigger in an attempt to destroy reality. Shortly after acquiring Team Venom's resources, Umbra altered the biological make-up of Darkrai's Dark Void fog and synthesized the Null Shade, a potent strain of Darkrai's signature attack that induces an instant state of forced hypnagogia, a nightmarish "waking sleep" in which the victim is clearly asleep but fully reactive to outside stimuli and suggestion. Other, less debilitating side-effects include hallucinations and a lack of emotional control, leaving its victim experiencing irrational terror, uninhibited rage, and depression, all at varying frequencies. While the effects of the Shade aren't overtly permanent, prolonged exposure can result in damage to one's mental state. Most recently, the leadership has found that despite its nature, using a less virulent strain of the Shade on the lowest-level, more expendable rank and file "Sleepers", has proven an effective means to assert control and ensure obedience. The Combine - Maintains Umbra's influence in Western Kasei. The Combine is the entry point for all grunt-level members following recruitment. Additionally, it houses the bulk of Team Umbra's actual force, so to speak. The Sandbox - Maintains Umbra's influence in Eastern Kasei. The Sandbox is responsible for all of Team Umbra's technological advances. The Null Shade as well as Shadow Pokemon are developed here, and promptly transported to the Combine for distribution to the various cells about Kasei. The Core - Maintains Umbra's influence in Central Kasei. The Core is the de facto headquarters for Team Umbra. The Core coordinates all of the organization's plans, and has oversight over the other two centers. It is easily the most heavily-defended of the 3 centers; the best of the Team Umbra's operatives are stationed here. Darkmoon Island - The key lair for Team Umbra. A previously hidden installation off the northwestern coast of Kasei where the organization launched its more final, most dangerous weapon, The Deimos Trigger in an attempt to destroy reality. Members of Team Umbra often utilize, but aren't limited to Dark, Fire, Poison, and Ground types, employing them in the group's various schemes. As with most nearly every villainous team to date, Team Umbra does incorporate a uniform for its field operatives in the form of a simple black glove outfit with deep-red trim. 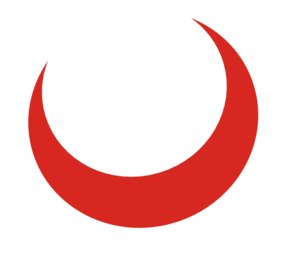 The organization's emblem, regarded as the Crimson Crescent is usually noticeable somewhere on the upper chest. Of course, this isn't the case for operatives working undercover as normal attired is generally encouraged for such roles. Presently, Team Umbra has been formally disbanded. Inductions have been suspended indefinitely.